How do I help my baby sleep well while teething? Have you ever found yourself thinking that every challenge parenting throws you is related to teething? She didn’t eat well today, it must be her teeth. She’s so grumpy today, and hasn’t stopped drooling. She was up all night her gums must be bothering her. I don’t know what’s wrong with my baby….teething???? I have to say that when I’m speaking to parents to understand their child’s sleep issues, this often gets the blame for a whole host of related problems. Regressions, short naps, disturbed nights, you name it, teething is the assumed culprit! Now, I’m not saying that the arrival of teeth doesn’t cause any problems. I’ve seen enough babies to know that some don’t handle it very well at all. When my son was 8 months old, I was convinced that the teething nightmare would never end! It felt like the end of the world! At that stage, I didn’t realise that there was a bigger issue with him, besides his teeth, which was that he never slept well. Studies have been done that show teething doesn’t really cause the significant pain that many of us think it does. There may be some discomfort for a day or two while the tooth is actually coming through the gum. However, it shouldn’t be the cause of disrupted days and nights over a long period of weeks or months. What can I do to help my baby sleep better when teething? 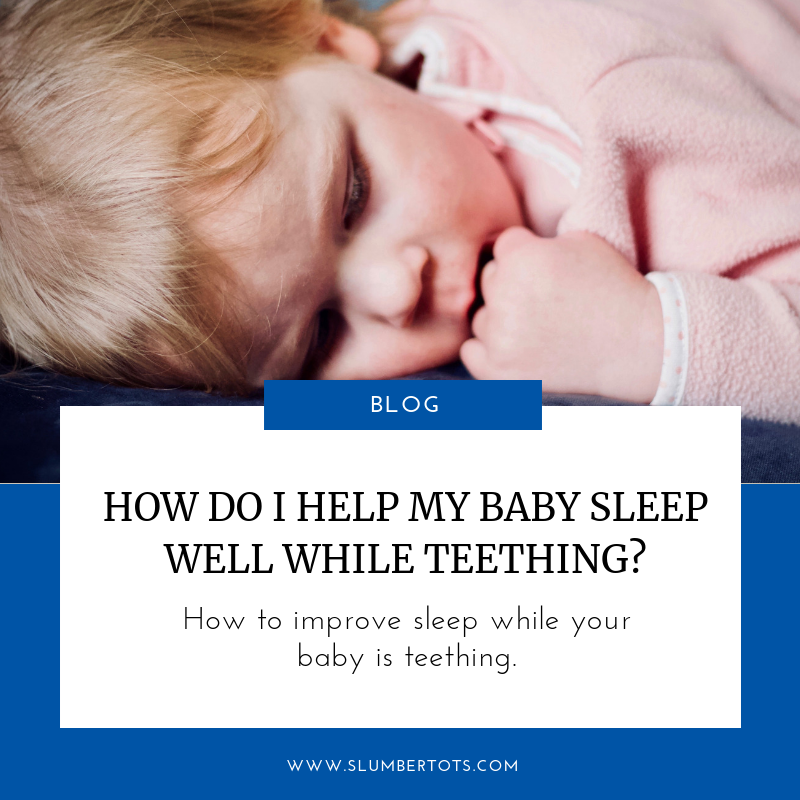 Before you look to teething as the culprit for disrupting your baby’s behaviour, I’d encourage you to take a look at how well your baby is sleeping and how they are falling asleep. An overtired baby who hasn’t learned to settle himself independently and who wakes frequently or takes short naps, tends to struggle with lots of things. This can be everything from travel to illness to milestone development to teething. It’s the same for us as adults; life in general seems easier to manage when you’ve had a good night’s sleep! If your baby isn’t sleeping well and seems to be struggling with teething, it may be time to implement some changes to teach him some independent sleep habits. For my son, once we taught him to settle himself to sleep, teething was no longer such an issue! I’d still see moments of grumpiness for a day or so when a tooth came through, and possibly a disturbed night here and there. But it was nothing compared to what we’d all endured previously. He became a happier baby and teething was just a blip on the radar, something we could all take in our stride. Or, if you’d like any help with getting things on track, then I’m always here to support you.